The carrier vesicles dock with the acidosomes and then fuse with these larger vesicles before or as the vesicles dock at the nascent Digestive Vacuole. Thus the contents of the carrier vesicles are first exposed to an acid environment in the acidosomes and phagoacidosomes and then to digestion in the phagolysosomes. (For a discussion of acidosome development see Allen, Ma and Fok, J. Cell Sci. 106:411-422, 1993). 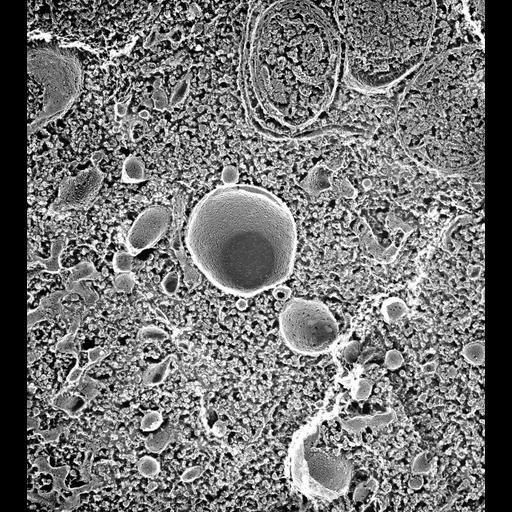 TEM taken on 7/19/88 by C. Schroeder with Zeiss 10A operating at 80kV. Neg. 24,800X. Published in J. Cell Sci. 106:411-422, 1993. Adapted with permission. The raw negative was scanned with an Epson Perfection V750 Pro and this high resolution image is best used for quantitative analysis. Additional information available at (http://www5.pbrc.hawaii.edu/allen/).